The idea of a pedaling a bike to blend a smoothie is innovative and can be a fun experience. But there are some problems with the blender bikes on campus regarding to where their location and ingredient selection. 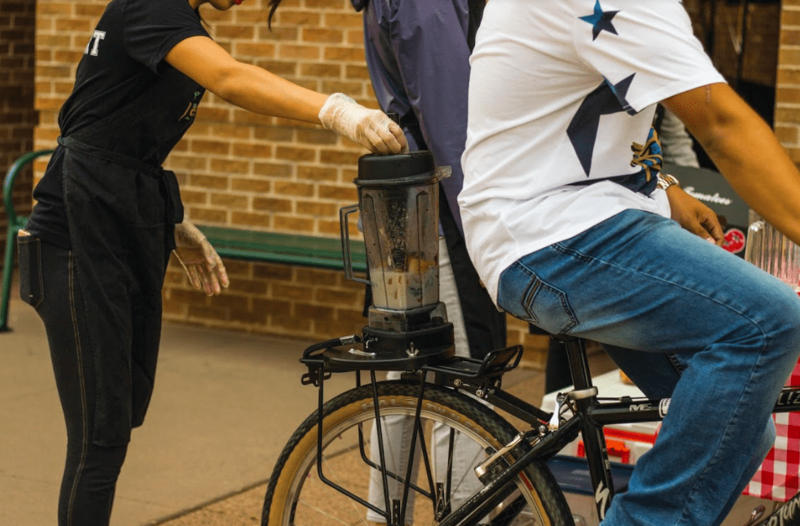 Blender bikes give students the opportunity to blend their own smoothie by pedaling on a bike to crush up the ingredients, according to Rock the Bike, a manufacturer of blender bikes. Smoothies made by the bikes are offered Sunday, Monday and Thursday during the lunch and dinner times at the Roaring Fork Dining Hall in the Alpine Valley. Lunch is at 11 a.m. to 2 p.m., while dinner is 5 – 8 p.m. Students can get smoothies with or without dairy. For students who have a meal plan, the smoothie will be charged to your account. However, if you are a commuter student, you will need to $8.25 to get into the dining hall, regardless of if you are only getting a smoothie or the all-you-can-eat meal. Students have the option to choose from several ingredients with vegan options available to make their smoothie, including flavors like pineapple cherry and vanilla maho. The absence of a menu, which can be limiting, is a good addition. I visited the Roaring Fork on Sunday and made a strawberry banana smoothie. Blender bikes are a good idea, but could potentially be improved by a stronger blender and a greater variety of fruit options. The actual process for blending the smoothies can prove to be challenging. Sometimes, the smoothies just won’t blend, no matter how rigorously you pedal. Fruit can get stuck under the blender blades, which caused me to use a knife to chop the fruit into smaller pieces. The possibilities of combinations are limited to the fruit available, including bananas, strawberries and cantaloupes, which are exclusively available for blending smoothies. Students can take kiwis, oranges, other fruits and vegetables from the baskets in the dining hall not with the bikes as well. If you visit Jamba Juice or other smoothie shops, there are lots of choices. Since there are only certain options available on certain days, this can be limiting to students, which as dissatisfying to me. With this limited amount of options, if you go through many times, you’ll do them all. I live in Alpine Valley, which isn’t too far. However, putting these in more central locations, like the library, would be a good source of exercise and healthy eating habits. Putting more bikes in The Lodge or possibly Cafe 65 could be better because it would be more accessible to students. This would open up opportunities to the amount of students who go to it. As a student who lives on campus, most of us who eat in the dining halls would prefer their food to be ready-to-serve and not have to take the time and effort to make their own food.